Two years after the 1906 earthquake, Santa Rosa wasn't quite ready to declare the city reborn - yet it wasn't averse to throwing a party to celebrate a job being well done. The occasion was the April 9th laying of the cornerstone for the new courthouse. Hundreds turned out for the ceremony to watch the Grand Lodge of Masons march solemnly to the square as Parks' band played the "New Creation March" (a ditty apparently so forgettable that it was never recorded after a 1909 Edison cylinder, which you can't even steal via the Internet). A time capsule was sealed in the stone containing newspapers of the day, photographs, business cards, membership lists from the Masons and other lodges, coins, and similar bric-a-brac. Only one thing of true value was encased in the box: A copy of Herb Slater's speech. Three judges and other notables spoke that day about local history, the resilience of Santa Rosans, and the utter swellness of Masonry. Judging from the excerpts published in the papers, everything said was self-congratulatory and forgettable until the reading of Slater's essay, which interrupted the stream of happy pap with a replay of the audience's worst nightmares. It was apparently as unwelcome as ants at a picnic. The Press Democrat mentioned only in passing that his remarks were read by the County Clerk; the Santa Rosa Republican didn't mention his contribution at all. Recounting the disaster, Slater did not flinch from the most awful details: "Men, women, and children bleeding and crushed hardly recognizable for blood and dust were borne away to hospital or home. Some lived only long enough after rescue to smile thanks to rescuer, relative or friend, while others passed out after their vision had taken just a fleeting glance at the awful scene around about them..."
But Slater's "historic sketch of the earthquake and fire disaster" (PDF) is as close as we come to having a true history of what happened in Santa Rosa on April 18, 1906. Not only is it the single most detailed eyewitness account (second place goes to the Jessie Loranger letters), Slater was an experienced newspaperman and then city editor for the PD. Although his essay was written in a more florid style than might be acceptable for a modern history book, his writing captured the moment vividly: "No one hesitated. With senses beclouded with the horror of the situation, men realized there was no time for delay. Delay meant death; death from the smothering dust; death from the cruel weight of beams, planks and stone; and worse than all, death from the cruel flames which were already bursting forth from piles of debris from fallen and partially fallen buildings. The belching smoke served to intensify the horror." The only known copy of the speech can be found in the LeBaron history collection at Sonoma State University, and is transcribed below. That version appears to be a carbon copy on onion skin paper, and is in deteriorated condition. Spellings and typos appear as they did on the original. Aside from his brush with death by earthquake and/or fire, Herbert W. Slater was a remarkable fellow; in 1976, Gaye LeBaron penned quite a nice profile, reminding us that he was a state senator for 36 years, while at the same time writing a daily political column for the PD. LeBaron documented that he was a populist with no allegiance to party politics, being registered while in office as a Republican twice, a Democrat three times, and once as a Progressive Socialist. But it was journalism that framed his life; he was credited as the writer who "invented" Luther Burbank because of an 1895 story for Hearst's San Francisco Examiner, and in 1947 he died at the corner of Fourth and E streets, heading towards the Press Democrat office to write his daily column. And as appropriate for a long-time Santa Rosan, his life has an obl. Believe-it-or-Not twist: Herbert Slater was blind since 1919, dictating his columns and his state legislative work. "For reasons of his own," LeBaron also added, "his blindness was a secret he kept from his sisters in England until the time of his death." Pen was never dipped in ink to record a sadder, more disasterous page in history than that which tells the story of the awful results of the giant tread of the earthquake and the after ravages of fire on the morning of April 18, 1906, which left Santa Rosa --- the fair "City of Roses" --- in ruins, and wrought havoc and death on all hands. It was at 5:15 o'clock in the morning, when all Nature was at rest, with the air balmy and conditions least suggestive of the sudden approach of a catastrophe, the likes of which the world had not known in modern times, that the hidden forces of Nature sprang into activity. Then buildings swayed, tottered, fell, people were hurled from their beds, chimneys crashed through roofs, beams were twisted and bent. There were two distinct shocks and the second finished the work of destruction, undoing in the brief space of fifty-eight seconds the work of man for half a century, entailing a loss of millions of dollars and far more important the loss of many human lives. Following the earthquake there was a stillness, - a stillness as of the tomb. A calm which to some people was almost as appalling as had been the mighty upheaval a few seconds previously. A hasty glance down town from the residences portion told what had happened. The eye failed to rest on unfamiliar landmarks. One notable monument which for nearly twenty-two years had risen majestically, a centrepiece towering above the other buildings in Santa Rosa -- the Courthouse dome -- was no longer visible. Other familiar objects were no more. Those dense white and red dust clouds told in many instances the tale of destruction. Then there was a general rallying of assistance. No one hesitated. With senses beclouded with the horror of the situation, men realized there was no time for delay. Delay meant death; death from the smothering dust; death from the cruel weight of beams, planks and stone; and worse than all, death from the cruel flames which were already bursting forth from piles of debris from fallen and partially fallen buildings. The belching smoke served to intensify the horror. in those moments human strength seemingly became superhuman. It was a battle for life. Spurred on by the cries for help from the ruins of wrecked buildings, every effort on the part of the rescuers was called into play. God alone knows how many thrilling snatches from death he permitted men to make that morning. Men, women, and children bleeding and crushed hardly recognizable for blood and dust were borne away to hospital or home. Some lived only long enough after rescue to smile thanks to rescuer, relative or friend, while others passed out after their vision had taken just a fleeting glance at the awful scene around about them. Many of the rescuers bore their precious burdens to the plaza and deposited them on the green lawns not covered with the debris of the wrecked Courthouse. Words cannot depict in all their realism the scene of that memorable day. The heart-breaking shrieks of those who mourned the loss of loved ones, the groans of the wounded and dying, the terror betrayed on every countenance, the fight of the rescuers, the onsweeping flames and the thousand and one things, each asserting a particular phase of sadness and distress -- all stand out prominently and memorably in the earthquake and fire disaster of April 18, 1906. And yet with it all there was no complaint. People who were spared, no matter if the holocaust had meant the loss of their all as far as worldly possessions went, were glad they were alive and could be of assistance to others. While the heroism of the men is commended, the heroic efforts of the women must not go unnoticed in this brief review. They moved about as ministering angels, unflinchingly assisting physicians and nurses in binding up the wounds of injured. Ofttimes prayer, uttered or unexpressed from the heart of mother, wife or sister, mingled with that of priest or minister in supporting some passing soul through the dark valley into the other and brighter world. Throughout the day and night the work of wrecking buildings and the rescuing of the dead and wounded went nobly on. Assistance came from Petaluma, Healdsburg, Cloverdale, and other towns more fortunate than Santa Rosa, the County Seat of Sonoma. The work of rescuing and the care of things generally was aided very materially by the calling out of the members of Company E, N.G.C. of Santa Rosa, and Company C, N.G.C. of Petaluma. The city was also put under military rule and thus life and property was protected. When it was evident that the unfortunates whose lives had probably been spared in hotels, or apartment houses, had been rescued, other relays of men went to work to take out the bodies of those who had perished. The Sunday School room of the First Christian Church on Ross Street was turned into a morgue and there is long rows the remains of those who had perished --- sometimes only a small handfull of bones or ashes --- were placed. The scenes attendant upon the identification of bodies were sad as such scenes must necessarily be. I will refer to just one, that of a mother and her two fair-haired children, the latter little more that babies. They lay sleeping in death side by side on a rude table in the morgue room. They had been caught in a falling building and killed. The total number of bodies recovered, or those known to have perished in the Santa Rosa fire and earthquake was seventy-seven. Purchance there may have been many a poor human, who was a stranger within the gates of Santa Rosa, on the morning of the earthquake, whose life went out and whose remains were obliterated by the flames, of which no earthly record is known. Through the strenuous efforts of the fire fighters, the fortunate saving of the fire engines and the fire fighting apparatus and the Merciful Providence that spared the wrecking of water mains and furnished a magnificent supply of water, and, more fortunate still, a tempering of the wind, the fire did not cross from the business section of the city. Consequently additional horror that would have attended the destruction of homes was spared. The section destroyed embraced both sides of Fourth Street from D Street to "A" Street, with the exception of a few one story buildings on the north side of Fourth Street. Hinton and Exchange Avenues; Third Street from Hinton to "B" Street; Main Street between Second and Third Streets; Mendocino Street between Fourth and Fifth Streets; and sections of "A" and "B" Streets. Among the notable buildings destroyed might be mentioned, Sonoma County Courthouse, (the corner stone of which is being laid by the Grand Lodge of Masons of California, this April 9, 1908,) the Santa Rosa City Hall; The Armory; the Occidental; The Grand; St. Rose, and Eagle Hotels, the Western Hotel; the Santa Rosa Bank; the Elks' Hall; the old and new Masonic Temples, -- the new Temple having just been completed and about ready for occupancy; the Athenaeum building, which was the big theater of the city capable of seating nearly two thousand people; the Eagles Hall; Redmen's Hall; Ridgway Hall; Sonoma County Hall of Records; the Santa Rosa Fire Department and Station; the Santa Rosa National Bank; the Piedmont Apartment House; Hahman's Hall; The Sunset Telephone Building; The hall of Santa Rosa Lodge of Oddfellows; the Santa Rosa Press Democrat and Republican plants and buildings; the Exchange Bank building and many blocks of business buildings, apartment houses, offices, stores, etc. The destruction of the Courthouse and the Hall of Records temporarily put the Supervisors and the county officials out of doors with nothing but the blue canopy of heaven as a roof tree. As soon as possible, tents were pitched around the ruins of the Courthouse on the plaza and one of them was set apart for each branch of the administration. The Supervisors met within a few hours after the earthquake in the open air of the plaza and made arrangements for the erection of temporary buildings and the rescue of the county books and documents from the Courthouse. 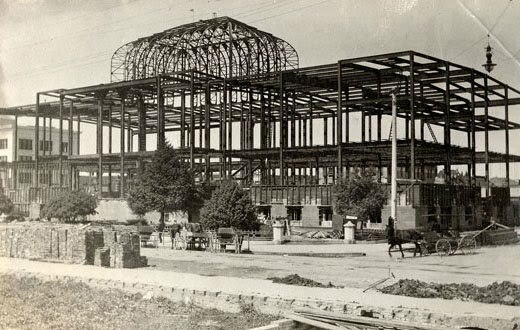 A temporary galvanized building was erected for the Hall of Records and wooden shacks were built on one side of the plaza, and later, when the construction of the new Courthouse was commenced, the offices and courts were moved into another temporary wooden building on Hinton Avenue. Fortunately none of the county buildings were reached by the fire. Hence, there was no destruction of records. Barely two years have passed since the terrible disaster and today, the occasion of the laying of the corner stone of the new Courthouse, April 9, 1908, the city has risen Phoenix-like from her ashes and is practically rebuilt. Magnificent structures have arisen, better and more substantial than over. Notable among the new structures in the greater Santa Rosa can be mentioned the hotels Occidental and Overton and La Rosa; the Elks Hall Building; the new Masonic Temple; the Santa Rosa Bank; Union Trust Bank and Exchange Bank; buildings and business houses extending throughout the whole of the district destroyed. In less than two years, thanks to the splendid spirit displayed, Santa Rosa has been built up better than ever before. But for the great catastrophe in San Francisco, earthquake and fire, the disaster in Santa Rosa would have been on the lips of the world. The overshadowing magnitude of the destruction of San Francisco turned general attention for the time being from Santa Rosa. Other places in the state suffered extensively, but San Francisco and Santa Rosa can be said to have felt the effects of fire and earthquake in all its severity. And this brief sketch of things that transpired at the time and since the earthquake would lack its most important detail if mention was not made of the great assistance, financial and otherwise, that poured in from outside sources for relief work particularly from California cities that escaped the disaster, and from all parts of the east. Relief headquarters were opened up in church edifices and other places, and clothing and eatables were distributed with a free hand. Money sent in was used for the relief of suffering, particularly among the fatherless and the widows and others who were desolute and oppressed. Those who lost their all and some of them their limbs were not forgotten. Human sympathy roused to its highest ideal at this time. The love of men and women came neared to the perfect ideal of Him whose mission was to care for the sick and afflicted than ever before in the history of the world. This may be said to be one of the silver linings to the cloud of despair that lay low over Santa Rosa and California at the time of the earthquake.